The Polish-born Alexandre Tansman (1897–1986) was one of the most prolific composers of the twentieth century. His fundamental style is a Stravinskyan Neoclassicism, animated by the dance-rhythms of his native Poland and energised by a masterly command of counterpoint. The substantial body of music he produced for his own instrument, the piano, has never been systematically examined in recordings. This first instalment presents works he wrote soon after his arrival in Paris in 1919, the city that was to remain his home – except for the years of World War II, spent in American exile. The American pianist Danny Zelibor is a native Texan who won a top prize in the Los Angeles International Liszt Competition. He is currently continuing his doctoral studies at the University of North Texas under the guidance of Joseph Banowetz. 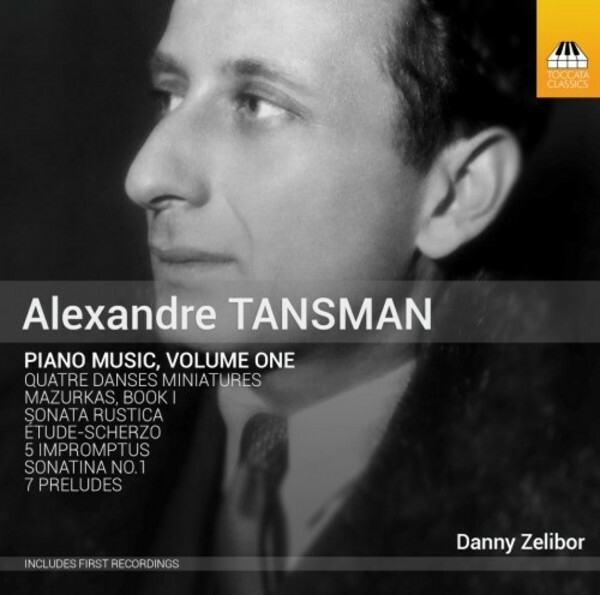 He has made a special study of the music of Alexandre Tansman, shaping his own career by a thorough academic and musical exploration of the man and his work. His thesis at Texas Christian University was on the music of Spain and Latin America, which has subsequently yielded a wide exploration of the Latin American and Spanish piano repertoire. His continued examination of this rich literature is giving him a degree of prominence among young American pianists.